“Necessary administrative measures will be taken for implementing tobacco control law in Chittagong division” as declared by Ms. Syeda Sarowar Jahan, Divisional Commissioner (Acting), Chittagong, in a sharing meeting on “Implementation of Tobacco control Law in Chittagong division” held at the conference room of Chittagong Divisional Commissioner office on 9 April 2017. The meeting was organized by Chittagong Divisional Commissioner Office, initiated by YPSA and supported by Campaign for Tobacco Free Kids. In the meeting, Ms. Syeda Sarowar Jahan, Divisional Commissioner (Acting) of Chittagong division was the chief guest and Dr. Alauddin Majumder, Director-Health, Chittagong Division & Mr. Nasirul Haque, Associate Editor of Daily Suprobhat were present as guest. Dr. Alauddin Majumder said that he would provide instruction to all district civil surgeons for mobilizing the sanitary inspectors for enforcing the TC law at district and divisional level. He also said that everybody should play their responsibility from their own positions. Mr. Md. Zillur Rahman, Assistant Director of Narcotic department, Ms. Raihana Akter Uthi, Assistant Director of BRTA, Ms. Farjana Parvin, Councilor of Chittagong City Corporation, Mr. Md. Asheke Rasul Chowdhury, Deputy Secretary of Chittagong City Corporation, representatives from Police, Ansar- VDP, Fire service, Navy, Islamic foundation, Trade union, business community, magistrates, TC focal point officer of Chittagong Division and ATMA members participated in the meeting. 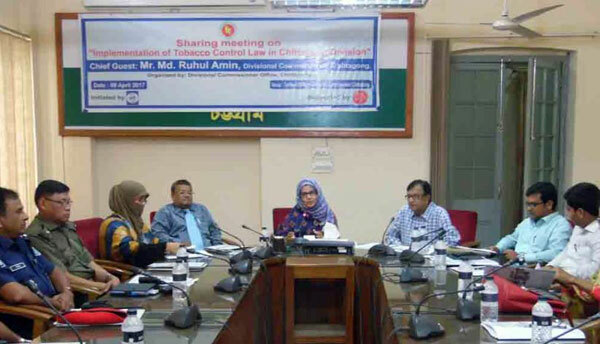 Ms. Nasim Banu, Team Leader, Smoke Free project, YPSA has presented the progress of Chittagong division for implementing TC law, violation of Tobacco control Law and some future measures for effective implementation of Tobacco control law. She also moderated the open discussion session in the meeting where participants shared their opinions on enforcing the tobacco control Law.